Recently a US non-profit known as the Center of Advanced Defense (C4ADS) released a report titled "Exposing GPS Spoofing in Russia and Syria". In the report C4ADS detail how GPS and Global Navigation Satellite Systems (GNSS) spoofing is used extensively by Russia for VIP protection, strategic facility protection and for airspace denial in combat zones such as Syria. 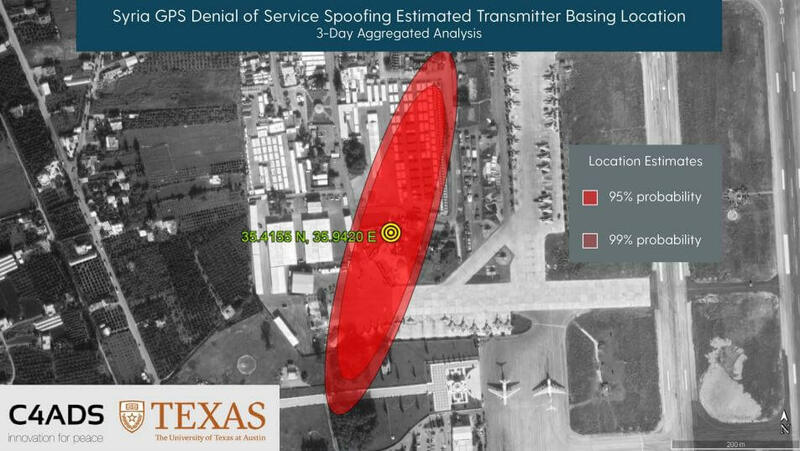 Using simple analysis methods that civilians can use, they were able to detect multiple spoofing events. GNSS spoofing involves creating a much stronger fake GNSS signal that receivers lock on to, instead of the actual positioning satellites. The fake signal is used to either jam GNSS signals, or report an incorrect location of the spoofers choice. 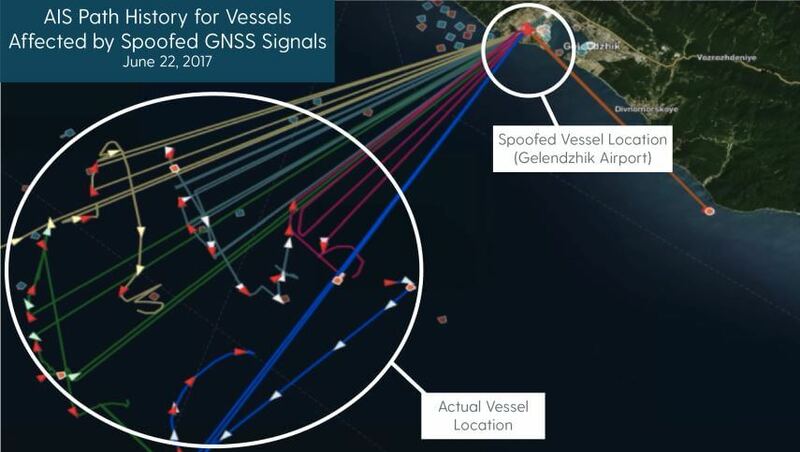 In the report, C4ADS mention how they used AIS data to identify 9,883 instances of GNSS spoofing which affected 1,311 commercial vessels since the beginning of February 2016. AIS is a marine vessel tracking system similar to the ADS-B tracking system that is used on aircraft. It works by broadcasting on board GPS data to nearby ships for collision avoidance. Although they don't appear to mention their AIS data sources, sites like marinetraffic.com collect and aggregate AIS data submitted by volunteer stations. By looking for anomalies in the collected AIS data, such as ships suddenly appearing at airports, they are able to determine when GNSS spoofing events occurred. An airport is chosen by Russia as the spoofed location presumably because most commercial drone manufacturers do not allow their drones to fly when their GPS shows them near an airport. This prevents commercial drones from being able to fly in spoofed areas. Using AIS data, the researchers were also able to determine that the Russian president uses GNSS spoofing to create a bubble of protection around him. During a visit to the Kerch Bridge in annexed Crimea the researchers found that some vessels near his location suddenly began appearing at a nearby airport. Similar events were detected at multiple other visits by the Russian president. Another interesting method they used to determine GNSS anomalies was to look at position heatmaps derived from fitness tracking apps. These phone/smart watch apps are often used by runners to log a route and to keep track of distance ran, speeds etc. The researchers found that runners going through central Moscow would sometimes suddenly appear to be at one of two Moscow airports. In a previous post we showed how Amungo Navigation's NUT4NT+ system was used to detect and locate GPS anomalies at the Kremlin. The C4ADS report also notes how several other Russian government facilities also show signs of GPS anomalies. Of interest, from photos they also saw that the Kremlin has an 11-element direction finding array which could be used to locate civilian drone controllers. Finally, in the last sections they show how C4ADS and UT Austin used a GPS receiver on board the International Space Station (ISS) to monitor a GPS spoofer at an airbase in Syria. Using Doppler analysis they were able to determine the location of the spoofer and confirm that it is likely the cause of multiple complaints of GPS interference by marine vessels in the area. The BBC also ran a story on this which is available here. RSA Conference is an information security event that was recently held on March 4 - 8 in San Francisco. The talks have been uploaded to YouTube and from what we see there are three interesting SDR/RF related talks that may be worth looking at, which we show below. The full list of videos can be found on their YouTube channel. Recent years have seen a flood of novel wireless exploits, from vulnerable medical devices to hacked OT devices, with exploitation moving beyond 802.11 and into more obscure standard and proprietary protocols. While other non-WiFi RF protocols remain a mystery to many security practitioners, exploiting them is easier than one might think. SDR is changing the game for both offense and defense.Learning Objectives:1: Become familiar with common security concerns and attack surfaces in a wireless communication system.2: Understand the ease and prevalence of wireless exploitation, with sophisticated examples.3: Learn to view IoT devices, security and privacy collectively. Rogue radio frequencies pose a substantial and often overlooked threat to both organizations and targeted individuals. This talk will explore the dangers of rogue radio frequencies and highlight tactics, techniques and tools which can be used to identify and locate potential threats.Learning Objectives:1: Understand the major ways rogue wireless frequencies can impact an organization.2: Develop a basic understanding of how to locate a rogue wireless signal.3: Gain a conversational knowledge of ways to identify and track a wireless signal.Pre-Requisites:Basic understanding of security principles. Basic understanding of wireless communication. Basic understanding of computer networks. Wireless Offense and Defense, Explained and Demonstrated! This session will discuss the use of radio frequency, often overlooked for network enumeration and attack. The techniques to be discuss are used to identify authorized and unauthorized signals in an organization. Without understanding the offensive attacks an organization can’t perform effective defense. The talk will explain and demonstrate how to enumerate and gain access to resources through RF signals.Learning Objectives:1: Understand that wireless doesn’t just mean WiFi.2: Understand that the Bluetooth protocol can allow for direct attacks against phones, PCs and other devices.3: Learn that other RF attacks are very difficult to detect, and gain an understanding of what they look like.Pre-Requisites:The biggest prerequisite for our talk is an open mind and the ability to understand risk, and after the talk to better assess risk on your environment. Recently we've heard of a new Linux distribution called SigintOS becoming available for download. 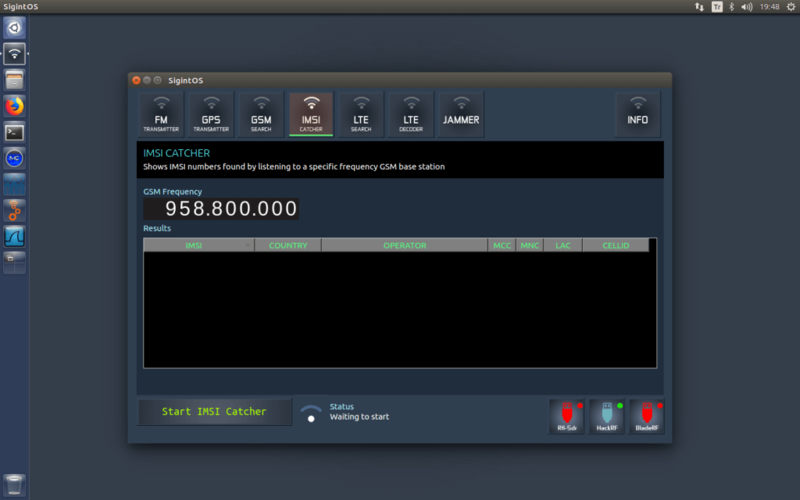 SigintOS is an Ubuntu based distribution with a number of built in signal intelligence applications for software defined radios such as RTL-SDRs and other TX capable SDRs like the HackRF, bladeRF and USRP radios. The distro appears to be very well executed, with a built in GUI that grants easy access to the some common sigint tools like an FM and GPS transmitter, a jammer, a GSM base station search tool and an IMSI catcher. SigintOS also has various other preinstalled programs such as GNU Radio, gr-gsm, YatesBTS, wireshark and GQRX. LTE IMSI Catcher is not myth! Due to the nature of LTE base stations, the capture of IMSI numbers seems impossible. LTE stations use GUTI to communicate with users instead of IMSI. The GUTI contains the temporary IMSI number called T-IMSI. This allows the operator to find out who is at the corresponding LTE station who is authorized to query T-IMSI information. Can the GUTI number be found? How to find GUTI and T-IMSI numbers? The image comes as a 2GB ISO file, and it's possible to run it in WMWare or VirtualBox. Back in December of last year Corrosive from his YouTube channel SignalsEverywhere showed us a demo video of him receiving unecrypted DECT digital cordless phones with his HackRF. DECT is an acronym for 'Digital Enhanced Cordless Telecommunications', and is the wireless standard used by modern digital cordless phones as well as some digital baby monitors. In most countries DECT communications take place at 1880 - 1900 MHz, and in the USA at 1920 - 1930 MHz. Some modern cordless phones now use encryption on their DECT signal, but many older models do not, and most baby monitors do not either. However, DECT encryption is known to be weak, and can be broken with some effort. In his latest video Corrosive shows us how to install GR-DECT2 on Linux, which is the GNU Radio based decoding software required to decode the DECT signal. He then goes on to show how the software can be used and finally provides some optimizations tips. Recently, the RF research team at Trend Micro released a very nice illustrated report, technical paper and several videos demonstrating how they were able to take control of building cranes, excavators, scrapers and other large industrial machines with a simple bladeRF software defined radio. Trend Micro is a well known security company mostly known for their computer antivirus products. Trend write that the main problem stems from the fact that these large industrial machines tend to rely on proprietary RF protocols, instead of utilizing modern standard secure protocols. It turns out that many of the proprietary RF commands used to control these machines have little to no security in place. Five different kinds of attack were tested. They included: a replay attack, command injection, e-stop abuse, malicious re-pairing and malicious reprogramming. The replay attack sees the attackers simply record commands and send them again when they want. Command injection sees the hacker intercept and modify a command. E-stop abuse brings about an emergency stop, while malicious re-pairing sees a cloned controller take over the functions of the legitimate one. And malicious reprogramming places a permanent vulnerability at the heart of the controller so it can always be manipulated. So straightforward were the first four types of attack, they could be carried out within minutes on a construction site and with minimal cost. The hackers only required PCs, the (free) code and RF equipment costing anywhere between $100 and $500. To deal with some of the idiosyncracies of the building site tech, they developed their own bespoke hardware and software to streamline the attacks, called RFQuack. Being a responsible security firm, Trend Micro has already notified manufacturers of these vulnerabilities, and government level advisories (1, 2) and patches have already been rolled out over the last year. However the Forbes article states that some vulnerabilities still remain unpatched to this day. Of interest, the Forbes articles writes that for some of these vendors the simple idea of patching their system was completely new to them, with the firmware version for some controllers still reading 0.00A. The videos showing the team taking control of a model crane, real crane and excavator are shown below. The video shows them using bladeRF 2.0 SDRs which are relatively low cost TX/RX capable software defined radios. We also recommend taking a look at Trends web article as it very nicely illustrates several different RF attack vectors which could apply to a number of different RF devices. In the past we've also posted about similar serious RF attacks to infrastructure and machines that reveal the vulnerability and disregard to wireless security present in everyday systems. These include vulnerabilities like taking control of city disaster warning sirens, GPS spoofing of car navigation systems, hacking wireless door systems on cars, and revealing hospital pager privacy breaches. Over on YouTube SignalsEverywhere (aka Corrosive) has uploaded a tutorial video showing how to use TempestSDR with an Airspy SDR. Back in November 2017 we posted about how we were able to get TempestSDR to run with an RTL-SDR, Airspy and SDRplay, and showed some results. Since then several people have managed to repeat our results, but many have also had trouble understanding how to make TempestSDR work and what all the settings are for. TempestSDR is an open source tool that allows you to use any SDR that has a supporting ExtIO (such as RTL-SDR, Airspy, SDRplay, HackRF) to receive the unintentional signal radiation from a screen, and turn that signal back into a live image. This can let you view what is on a screen without any physical connections. Corrosive's tutorial video shows us how to tune the signal in the TempestSDR software in order to receive a clear image as well as showing the software in action. Over on YouTube SignalsEverywhere (aka Corrosive) has uploaded a new video where he shows a demonstration of him listening in to a DECT digital cordless phone with his HackRF. In his video Corrosive uses gr-dect2, a GNU Radio based program that can decode unencrypted DECT signals. In the video he shows it decoding a DECT call from his cordless phone in real time. 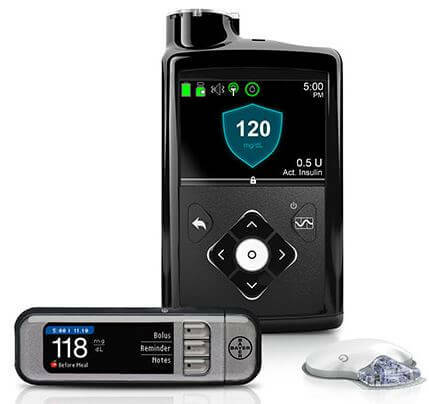 In May 2018, an external security researcher notified Medtronic of a potential security vulnerability with the MiniMedTM Paradigm™ family of insulin pumps and corresponding remote controller. We assessed the vulnerability and today issued an advisory, which was reviewed and approved by the FDA, ICS-CERT and Whitescope. This vulnerability impacts only the subset of users who use a remote controller to deliver the Easy Bolus™ to their insulin pump. In the advisory, as well as through notifications to healthcare professionals and patients, we communicate some precautions that users of the remote controller can take to minimize risk and protect the security of their pump. As part of our commitment to customer safety and device security, Medtronic is working closely with industry regulators and researchers to anticipate and respond to potential risks. In addition to our ongoing work with the security community, Medtronic has already taken several concrete actions to enhance device security and will continue to make significant investments to improve device security protection. In addition to this wireless hack they also revealed issues with Medtronic's pacemaker, where they found that they could hack it via compromised programming hardware, and cause it to deliver incorrect shock treatments. Earlier in the year we also posted about how an RTL-SDR could be used to sniff RF data packets from a Minimed Insulin pump using the rtlmm software, and back in 2016 we posted how data could be sniffed from an implanted defibrillator.